Approx. L 12" x W 10" x H 3"
Do you know what happens to Stormtroopers who can’t shoot a target to save their life? They get promoted. The ones who can hit targets (at least most of the time) get fired. But what is a lonely Stormtrooper to do when he is let go by the biggest organization in the Galaxy? It’s not like it’s easy to find a job just anywhere. The Rebels sure won’t hire you. Why don’t you give a guy a job this Halloween? 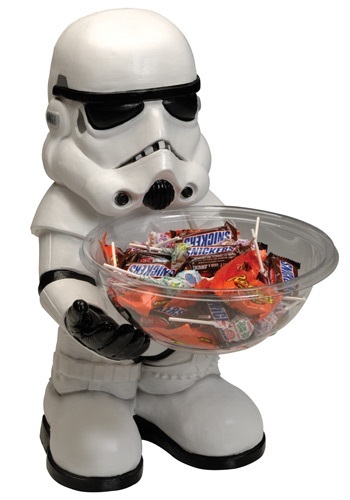 This Stormtrooper will be glad to be a Candy Bowl Holder. He will be thrilled to stay on after the holiday season as well. This ex-Stormtrooper will be glad to become a key ring holder, or really holder of anything you need. He might even be willing to defend your home while you are away. He would be good at it too…we all know why he was fired after all.